James Joseph Bierbower, 81, a well-known Washington lawyer who represented Nixon campaign aide Jeb Stuart Magruder during the Watergate trials and EPA official Rita Lavelle during a Superfund inquiry, died of pneumonia February 5, 2005, at Charlotte Hall Nursing Home in St. Mary's County. He had Alzheimer's disease. He practiced law for 49 years in Washington, representing a bevy of capital characters. Most infamous was Magruder, a White House aide who admitted that he perjured himself, recanted and testified against others in the scandal. A decade later, Mr. Bierbower was in court for Lavelle, who was found guilty of perjury and obstructing a congressional inquiry into her management of the Environmental Protection Agency's $1.6 billion program to clean up hazardous waste sites. He briefly represented Saudi financier Adnan M. Khashoggi in some banking matters. Mr. Bierbower also worked for the owner of Sholl's New Cafeteria, a Washington landmark and one of the city's most popular restaurants for 55 years, which lost its lease at Vermont Avenue and K Street NW in 1984. Although he talked about Watergate quite a bit, "he loved to reminisce about people coming in with a tangled will or estate problem and getting it untangled," said his son Mark Bierbower. Mr. Bierbower was president of the voluntary Bar Association for the District of Columbia in 1978, and three years later became president of the mandatory D.C. Bar. He was named lawyer of the year in 1989 by the voluntary bar association. He didn't hesitate to stir things up while he was the D.C. Bar president. In 1981, he arrived unannounced with three fellow lawyers at the bar's lawyer referral service office, causing a ruckus over access to records and files. "I want to find out everything I can legitimately find out about [the referral service] and about the whole bar. I am the president. And I want to find out what's going on, if it takes all year," he said. As befits a former journalist -- Mr. Bierbower was a reporter at the Nebraska State Journal in Lincoln briefly before World War II -- he was a quotable personality. Commenting on speculation in 1982 that he would run for the American Bar Association presidency, he said, "If elected I will serve, but it's harder to become ABA president than it is pope." The previous year, while attending a dinner of the bar's disciplinary board, he was invited to say a few words. "I'm tempted by the invitation and perhaps I should resist," he was quoted as saying in The Washington Post. "But I won't." He then lit into the board, questioning the fairness of the whole process, noting that wealthy uptown lawyers sit in judgment of attorneys who don't have the benefit of secretaries, paralegals, messengers and computers. Mr. Bierbower, who lived in Bethesda and Chevy Chase, was born in Giltner, Nebraska, and enrolled at the University of Nebraska in 1940. His education was interrupted by World War II; he enlisted in the Marine Corps and become a F4U Corsair fighter pilot. He served as a First Lieutenant in a squadron known as the Death Rattlers, aboard aircraft carriers in the South Pacific. He was awarded the Naval Air Medal for his actions in combat. After the war, he enrolled in Georgetown University, where he received a bachelor's degree in 1947 and a law degree in 1949. He was a member of the Georgetown Law Review and obtained a master's of law degree from George Washington University in 1954. He began working in 1950 at the general counsel's office of the Central Intelligence Agency. A year later, he began a five-year stint at Covington & Burling. He opened his own office in 1956. He was a partner in the firm of Bierbower and McGrath from 1967 to 1968, of Bierbower & Rockefeller from 1968 to 1980, and of Bierbower & Bierbower from 1980 until he retired in 1995. He was a fellow of the American Bar Foundation and taught trial practice for 25 years as an adjunct professor at Georgetown University Law Center. Mr. Bierbower was a member of Blessed Sacrament Catholic Church in the District, and he served as president of the John Carroll Society. He also was general counsel and trustee of the D.C. chapter of the National Multiple Sclerosis Society and a member of the Metropolitan Club. Survivors include his wife of 57 years, Ellen Butler Bierbower of Chevy Chase; four children, Mark Bierbower and William Bierbower, both of Bethesda, Ann Lally of Atlanta and Joan Kaye of Laurel Hollow, N.Y.; and 11 grandchildren. 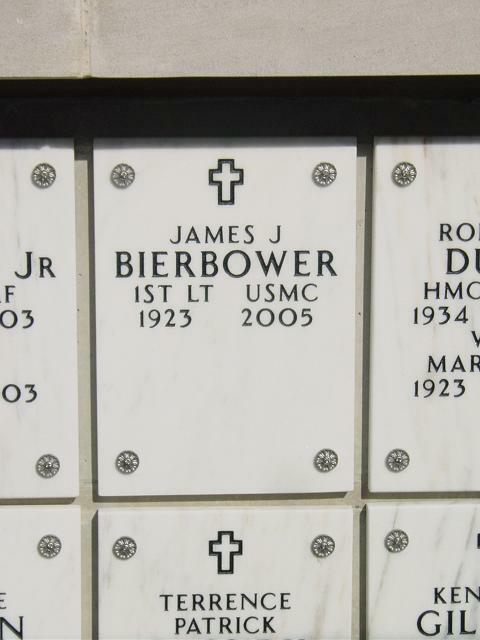 Mr. Bierbower was laid to rest in Arlington National Cemetery on 30 June 2005.